A massive earthquake and tsunami on March 11, 2011, triggered the disaster at the Fukushima Dai-Ichi Nuclear Power Plant in Japan. Shortly thereafter the New York Times produced this map below showing how radioactive materials released from Fukushima were being carried by wind to North America. 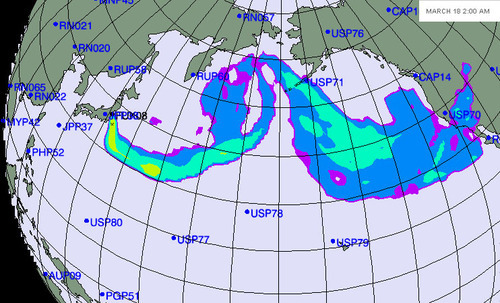 On February 21, 2012, USGS published a report showing where fission products released from Fukushima were deposited in precipitation in the United States (see http://pubs.usgs.gov/of/2011/1277/ ). 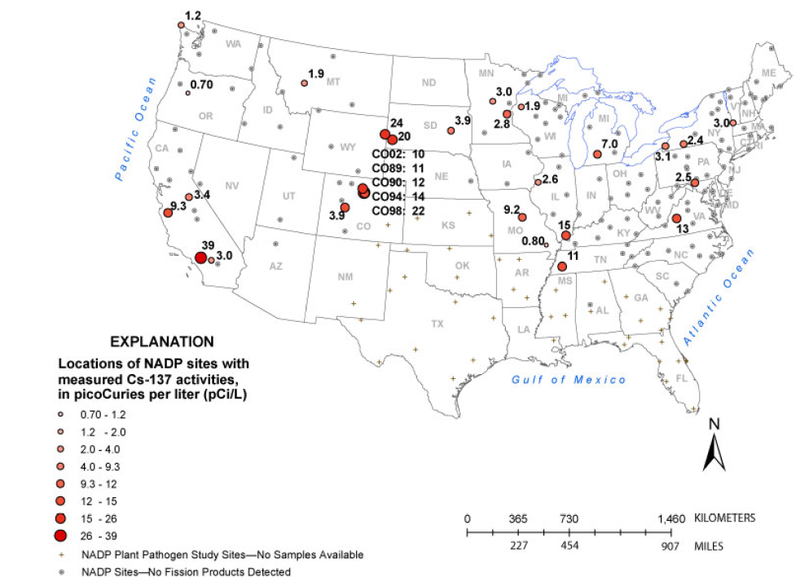 USGS monitoring stations in the Boulder area registered some of the highest deposits anywhere in the USA for radioactive cesium released from Fukushima (see map below). Readers of this article may recall that last fall the Rocky Mountain Peace and Justice commissioned Marco Kaltofen of the Boston Chemical Data Corp. to collect soil samples at Rocky Flats in the area intended for construction of the Jefferson Parkway. His findings of plutonium in soil there confirmed our suspicions that constructing this highway along the edge of the Rocky Flats site would endanger public health danger by stirring up plutonium-laden dust. These findings about plutonium were widely reported, including in the Blue Line. What we did not then report was that the samples Kaltofen collected at Rocky Flats in September 2011 also contained cesium. Based on the independent network he had established to monitor airborne releases from Fukushima (see http://fukushimaupdate.com/marco-kaltofen-on-airborne-radiation-spread-video/), Kaltofen concluded that the cesium found in his Rocky Flats samples came from Fukushima. The recent USGS report confirms his conclusion and shows that there’s a link from Fukushima to Rocky Flats. People in the Denver-Boulder are and across the U.S. and around the globe are affected by Fukushima, a disaster that continues. The public is invited to “3-11: Fukushima One Year On,” an event of commemoration and commitment sponsored by the Rocky Flats Nuclear Guardianship Project of the Rocky Mountain Peace and Justice Center, Sunday, March 11, 3-5 PM, Naropa University, Lincoln Campus, Room 4130, 2130 Arapahoe Ave., Boulder. Previous Topic: The Train, the Bus, or Both?